I'm in need of some optics - or at least thoughts on - for the HandiRifle mentioned in my last post. I'm vaguely tempted by the Leupold Deltapoint ($400) or even an EOTech, but that's really reaching into the same range as the Aimpoints. Anyone have pros or cons for each of the above? It's an AAC HandiRifle in 300BLK, with their 51T flash suppressor/suppressor mount on the barrel. I've got the 5/8-24 thread protector tucked away. This thing is LIGHT - a hair over 5lb without a sight - and tiny. The FFL I used measured the barrel to be SURE he was OK to transfer it. Beyond that, the LOP is about an inch and a half shorter than the 15-22; overall it's about 3" shorter. No can yet ... but I will procure one eventually. I have company for the weekend, so fate decided to give me a swift kick in the pants and I got mandated for overtime today. There's a thousand-table gun show going on this weekend. I elected to skip it yesterday, since I was dog-tired and we weren't feeling motivated to do a whole lot. I had debated checking it out today. Ah well. Not to be. It runs again in October; I will probably try to check it out then. The intended range trip for today has also been cancelled. We may try to do that tomorrow instead. We DO have reservations for dinner tomorrow evening at Em Chamas. I intend to eat myself stupid on grilled meats. I flipped a few things (see previous post, most of that is still around if anyone is interested) and have a new boomstick on the way. Stay tuned for that. I am considering trying CeraKote on this one. Got a lead on a good deal on a nifty piece of equipment. Have some of the money, not all of it. 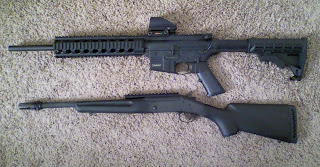 Anyone interested in a complete AR/A2 lower, Hipoint carbine, or Kabar Potbelly knife? drop me a note. I've shuffled around the order of things in the safe. I keep a rifle at the very front, with a full mag or two sitting on top of the safe. I just changed that rifle from a 5.56 AR to the M&P15-22. ... not on the bedpost or the gunbelt, but on the freedom list. Seems Missouri isn't afraid of automatic knives, aka "switchblades". I've ordered a Boker Mini Kalashnikov to see how it feels. And ... because I can. For the M&P15-22 owners out there ... For a while, magazines were hen's teeth. They're more common now but most places are trying for panic prices still. Midway has factory 25-rounders in stock for $17. Yes, I ordered a couple. (A company I won't do business with) is releasing a "Zombuck" silver round next week. Unlimited mintage but there is a cutoff date on orders. Right now looks like about $22/oz, which isn't a bad price for a round that will likely carry a premium in the future. And, through 1700 today (the 8th), coupon code "ZOMBUCKFISH" will snag free shipping on any order that includes at least one of the Zombucks, saving you $6+. Figured it was worth mentioning. I just got email from Brigid, asking that I pass this along. TinCan Assassin is in the hospital with some kind of heart issue; his wife passed the info to Brigid and will keep her updated. I'll post any updates I receive. If you could keep him and his family in your thoughts and prayers, light a candle, whatever, it'd be appreciated. TCA is stable and apparently Mrs. TCA is feeling a little better about things.